WAS $115 Knit tee shirt with cute, lacy pockets that add a fun touch. This makes a great summer top in a sage green in color, and is comfy and versatile with short sleeves, scoop neck, and not-too-long length. Color is a sage or mineral green, easily coordinating with blues and gray, or brighten it up with a colored bottom piece! Hand knit with a comfortable seamless construction, in a cool cotton and merino yarn to span three seasons. Designed to fit a womens medium, actual bust 37-38", worn with 2-3" of ease. 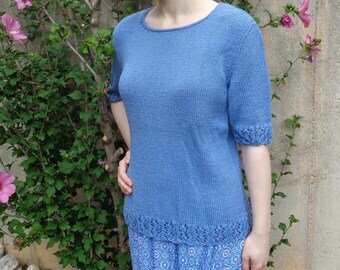 Can also fit a size small as a slouchy top, or on a large as a more fitted top.